PinkyPiggu: Hokkaido Sushi Japanese Ala-Carte Buffet @ M Hotel, Tanjong Pagar ~ Fantastic Value For Under $50++! 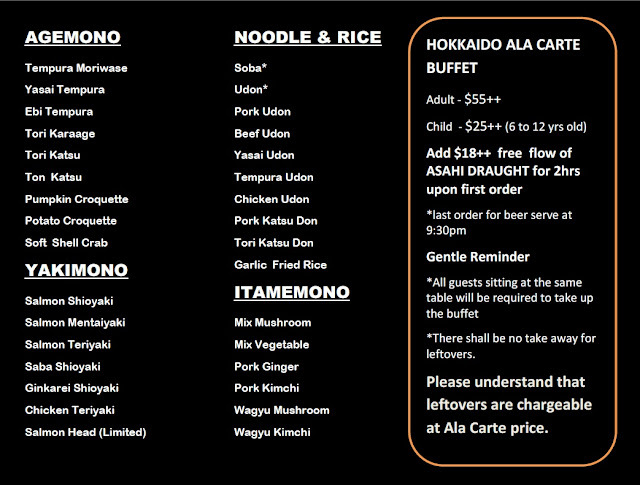 Hokkaido Sushi Japanese Ala-Carte Buffet @ M Hotel, Tanjong Pagar ~ Fantastic Value For Under $50++! Many a times I'm hesitant about going for buffets, because the tendency to overeat is detrimental to my diet plans and also, having to make multiple trips to the buffet line for the food is too tiring. Too greedy. Too lazy. Lol! Then comes Hokkaido Sushi Restaurant's Japanese Ala-carte Buffet. Having dishes prepared a la minute and sent straight to my table? A good selection that caters to my preference for variety? Decent quality that's worth the calories? A "full"-filling meal that wouldn't break my wallet? All checked. I'm sold. So I jio asked BFF along to M Hotel where Hokkaido Sushi is located on level 9. Go hotel can be just for food okay. Those whose thinking is still stuck in the last century, please go knock yourself in the head. We were more keen to see what Hokkaido Sushi has to offer. Not much of that authentic feel when it comes to its interior or ambience, but with a spacious main dining hall, 4 private rooms and a 14-seater sushi counter, I would say the functionality serves its clientele of office workers, hotel guests and regular patrons well. Produce-wise, fresh fish and seafood are imported from Tsukiji and Sapparo every Tuesdays and Fridays. Then again, we wouldn't expect anything less. But we were quite surprised when told that Australian Wagyu is served at the buffet. It is not often that we get to enjoy prime beef in unlimited quantity, do we? Even the rice used for sushi, Nanatsuboshi rice, is of an organic high grade kind, known for its sweetness even when eaten on its own. Hokkaido Sushi prides itself that they are one of the selected few Japanese restaurants in Singapore which serve this premium rice. Their omakase set meals and ala-carte items are said to be popular, but the restaurant have recently decided to launch The Hokkaido Buffet Experience, an ala-carte buffet menu which includes most of their signature dishes at a single price. Undeniably, this is a good chance to have a taste of their specialties without having to fork out an arm and a leg. What's more, the current Special Promotion of $38++ (U.P. $48++) for Lunch, and $43++ (U.P. $55++) for Dinner made it even more attractive. The buffet menu might not be the most extensive I've seen, but it has a good selection of items in each category of Appetizer, Sashimi, Sushi, Maki (roll), Temaki (handroll), Agemono (deep-fried), Yakimono (grilled), Itamemono (Stir-fry), as well as Noodle & Rice. We systemically started off with appetizers such as the crowd favorite Pitan Tofu, Ikura Chawanmushi, Pork Gyoza, Tamagoyaki and Edamame before moving on to the Sashimi Platter comprising of Maguro (Tuna), Mekajiki (swordfish), Hamachi (yellowtail), Salmon, Tako (octopus) and Hotate (scallop). Even I who is not really fond of raw food was captivated by the fresh succulence of the scallops! The scallops were also best enjoyed aburi sushi-style, topped with a dallop of garlic miso and briefly torched for a light smoky taste. Together with tobiko, the entire parcel was such an enjoyment in the mouth. We loved the Salmon Sushi with mentai aburi too, as well as Prawn Sushi with spicy paste. Our advice is also to go go go for the Hokkaido Maki, a rolled sushi topped with ebiko, special sauce and mayonnaise with a bite of salmon in the middle. The medley of texture and flavors was exceedingly pleasing! We figured the special sauce played quite a pivoted role in making it such an addictive treat. The Tempura Moriawase of prawns and assortment of vegetable was very much a delight as well with its light batter deep-fried to non-greasy crispiness. Less impressive was the Tonkatsu as the pork cutlet was a tad dry and lean for our liking. For the grilled dishes, our vote went to the Ginkarei Shioyaki. It is a white fish, rich in natural oils with a smooth buttery bite that's rather similar to cod fish. Salmon Head came in a close second with meaty flesh that needed just a tiny squeeze of lemon for some zest to complement its freshness. I was pretty excited about the Australian Wagyu earlier but disappointment set in as the Japanese beef was served as a stir-fry dish with either mushroom or kimchi. This cooking method did not allow us to savor the best of the beef at all, with the stronger tasting kimchi masking whatever flavors that the beef should have. The pairing with mushroom was worse with that strange unfathomable aftertaste. Oh well, nevermind. We do not foresee every dish to be perfect anyway. Fortunately, the Garlic Fried Rice quickly took the attention away. We had the most lovely garlic breathe after! Lol! The Pork Udon was utterly comforting too, especially that warm, savory broth which was slurpilicous till the last drop. Overall, the buffet experience at Hokkaido Sushi was of more hits than misses. Considering the price point, the quality and value we've got was more than worth it. But do not just take my word for it, you might just discover items on the menu which suits your palate better. This being a buffet, do try as much as your appetite allows. Get your friends, colleagues to join and increase the dining joy. * Special Promotion price is valid at published date of this post. * All guests sitting at the same table will be required to take up the buffet. * There shall be no take away for leftovers. 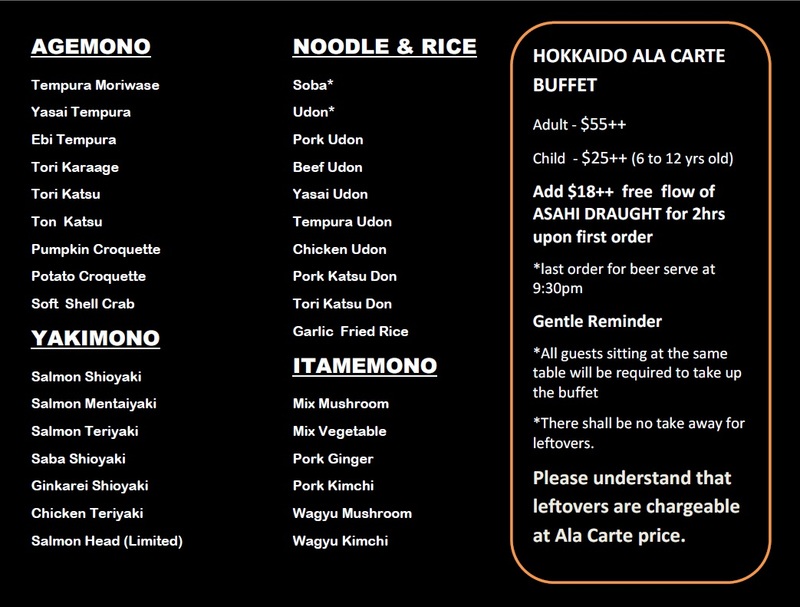 * Leftovers are chargeable at ala-carte price. Hello, how's the service there? 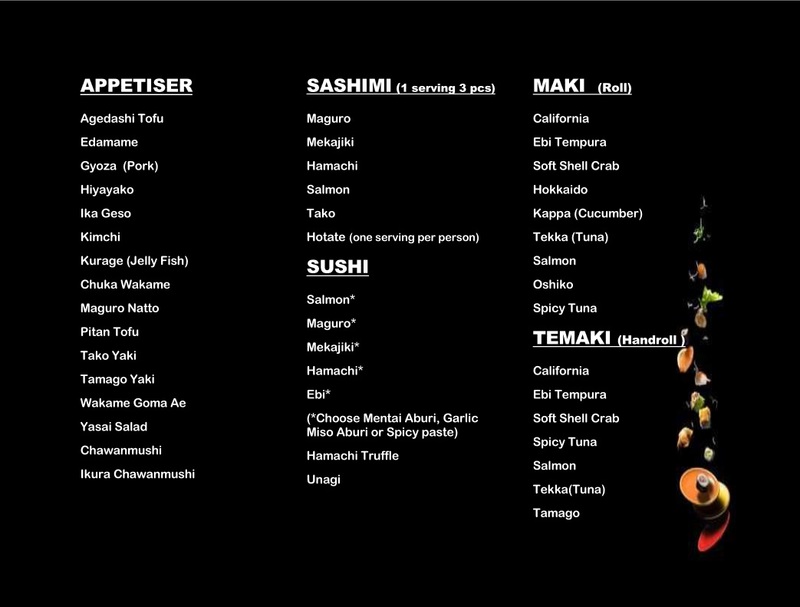 I dont like to feeling whereby being judge when ordering too much sashimi. Because i experienced once elsewhere, they judge as they dont usually do buffet.